I finally had a chance to pull together a bunch of interesting timeline examples–mostly about the U.S. Congress. 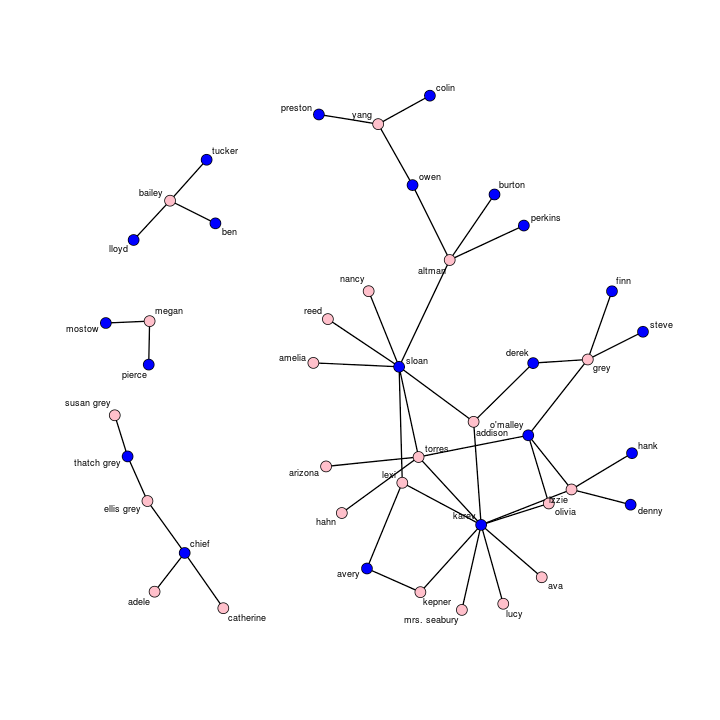 Although several of these are about networks, the primary features being visualized are changes in group structure and membership over time. 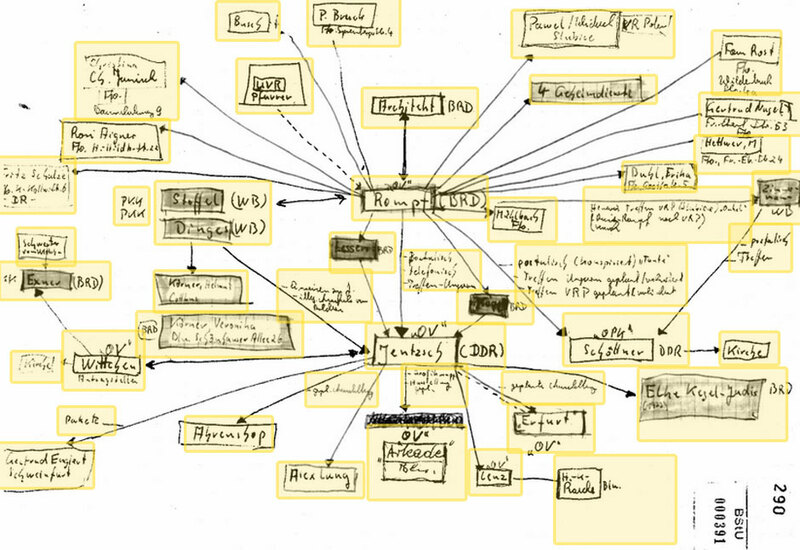 Should these be called “alluvial diagrams”, “stream graphs” “Sankey charts”, “phase diagrams”, “cluster timelines”? 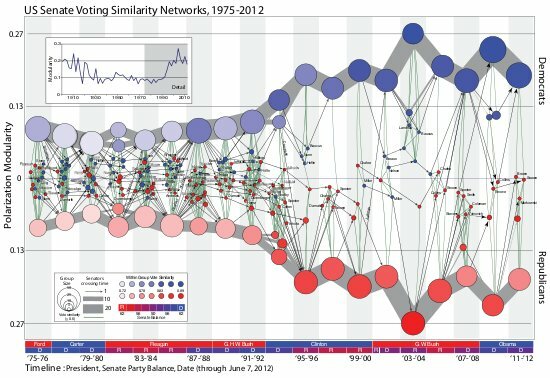 James Moody and Peter Mucha’s Portriat of Political Party Polarization (in the new Network Science journal) plots the network modularity score of structurally-equivalent voting clusters in the Senate co-voting network as they change over time. The lines show the movement of Senators between clusters over time. The figure maps this dynamic coalition network, one two-year Congress at a time. Nodes indicate structurally equivalent positions, scaled by number of Senators and shaded by their voter agreement level. In each period there are two “party loyalist” positions, anchored on the y-axis proportional to the modularity score. The y-position of other nodes—usually individuals—is based on the balance of their votes relative to these anchors. Positions are linked over time by identity arcs connecting each person to themselves over time, labeled to trace individual careers (the widths of arcs between aggregate positions indicate the number of people moving between them over time). Dr. Michael White wrote to let me know about an exhibit / performance at a science museum that used a network animation produced with the ndtv package. … we used QR codes and tablets to monitor the spread of an infectious disease throughout people attending the museum, and perform dynamic network visualizations in real time. 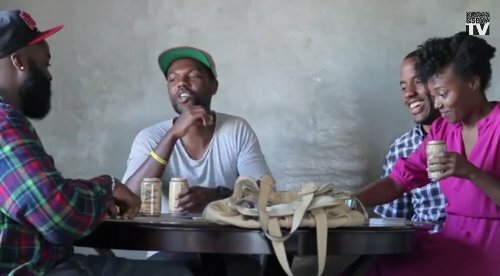 The article is a little vague about exactly how this worked, but it sounds like the visitors were given tokens to pass to each other, a few of which were labeled “infected”, and at various points they were scanned in by staff and the data used to update the animation of the transmission network? The animation is included in the article. Cool to see the software used in real life! 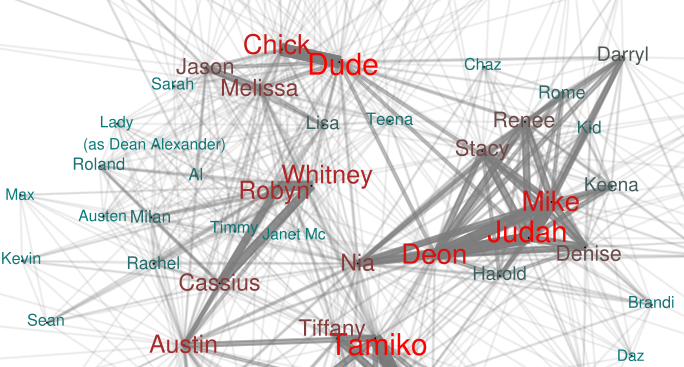 Just saw this really nice blog post at badhession.org explaining how to do Exponential Random Graph Modeling (ERGM) using a sexual-hookup network from the TV show Grey’s Anatomy.